The twinkle in her eye gives away the possibility she did it. Dramatic entry ways with large, white marble flights of stairs, the smell of incense and statues of Buddha in various iterations jolt one to awakening as the journey begins through His Lai Temple, the largest of its’ kind in the United States, to the four grand hallways of Fo Guang Yuan Gallery that hold the other-worldly work of Emi Motokawa. The Buddha Nature exhibit brings the teachings of the Lotus Sutra, one of the most influential scriptures of Buddhism, to light in the simplest and most accessible of ways through the lens of hip-hop and wide-eyed souls occupying the space of another realm. This in itself is the forefront of artistic innovation: taking potentially abstract ideas and transforming them into concrete, accessible concepts that instantly strike the soul. This is the first time in history that art, Buddhism, and Hip-Hop intersect in such a way. To house this meeting inside the walls of a breathtaking temple so grand in scope, supports the work in a way no other venue could. 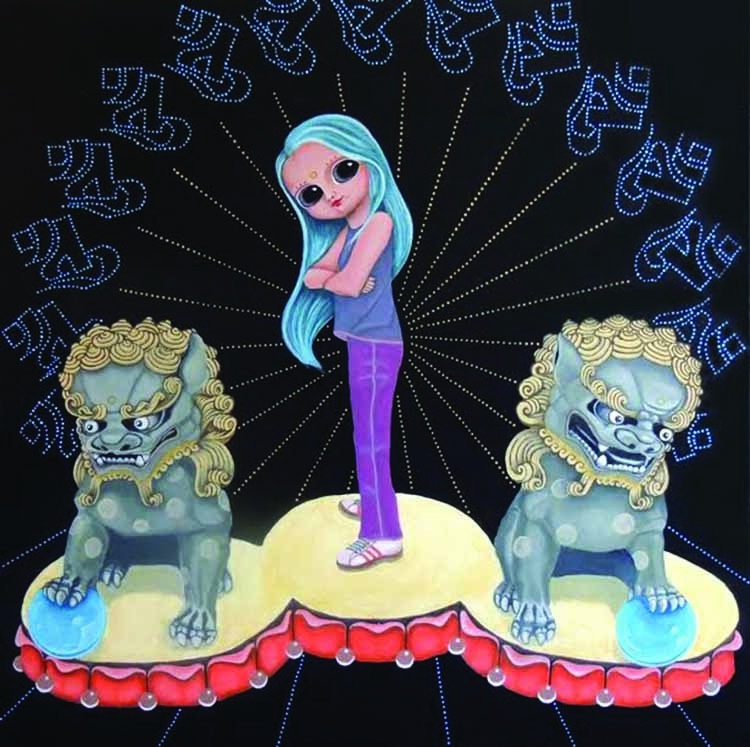 The kids run rampant down the glowing hallways of paintings as Motokawa, calm and unfettered by the wild patter of tiny feet, speaks to her journey with respect to the show. “For this exhibit, my inspiration is Buddhism but more specifically, the concept of the ‘Buddha Nature.’ This is the idea that says everyone carries within themselves the seed to sprout into an enlightened person,” Emi says. Each piece strongly reflects Emi’s practice. The images are consistent, many elaborated around a wide-eyed, ethnically ambiguous woman actively engaged in her own Buddha Nature. Under trees, boom boxes in hand, piercing gazes…these often androgynous, angelic creatures incite the viewer to look at his or her relationship to Buddha Nature, thus causing a shift the same way prayer or meditation can often do. We turn down yet another hallway and a myriad of white Buddha and Divine Mother Quan Yin statues are reflected back at us by multiple mirrors, creating a beautiful and electric sight, similar to the feel of Emi’s paintings, exemplifying the interaction between the place and the show. She turns to me and explains that the display is meant to convey the magnification of thoughts and their immense ripple effect…either positive or negative. “If our thoughts have such impact, better to think good thoughts, no?” Emi posits as a way to illustrate the concept of amplification. The final section of the exhibition addresses a different concept: mindfulness in the present. There is a distinct difference in the feel of the works meant to conclude the show. The clearly convey a piercing and intense presence. Emi confesses that she is moved to further explore this idea in work she has yet to make. Emi Motokawa moved to the United States from Japan when she was seven-years-old. Raised in Monterey Park, she attended both Buddhist Church and Japanese school in Boyle Heights through most of her childhood. She is devout Buddhist, and has even had the occasion to study Buddhist teachings abroad in an effort to fully embrace a personal adherence to the practice of what she has learned. During a trip she made in 1995, she was struck by the inspiration to translate Buddhist ideas into images. “There are many influences, such as being born into the Japanese culture or attending a Buddhist seminary in Tokyo, but I think the biggest influence that affects my work is just living in So Cal under the light of multiculturalism with all its ups and downs,” she offers. “I was also once a flight attendant and got to fly around the United States and internationally. This also exposed me to a bigger world of differences and similarities”. Emi’s work graces the city in other powerful contexts. Her painting of the City of Monterey Park is being displayed inside L.A. County Metro buses and rails for MTA’s “Through the Eyes of the Artist” poster series. Her three-foot crocheted Krokeshi Dolls, created as part of a previous series, were featured at the Japanese American Museum. She has also shown work at premiere galleries throughout Los Angeles, among them the Hive, LA Municipal and La Luz de Jesus Gallery. It is pertinent to note that Emi Motokawa is a wife and mother with two small children for whom she assumes primary responsibility as a parent who works from her home. Many, if not most, female artist’s voices are and have been lost to the demands of their families and the subjugation of women in a cycle that yokes them to the care and feeding of children, a responsibility rarely shared equally between both parents in our allegedly modern society. It is an enormous feat that Emi is able to churn out such a prodigious quantity of work in the wake of her recent introduction to motherhood. The way in which she brings the work forth is awe-inspiring. I was blessed to experience a bit of her process when I visited her home. Artists typically need designated rooms and solitude to create a large volume of work around a specific concept or theme. In the midst of toys, family photographs, and children running about, Emi’s easel rises austerely from the chaos, functioning much like a beacon of light. “Messenger of Compassion,” a painting-in-progress depicting a six-armed, red hoodie and Adidas shell-toe wearing woman in prayer, rests firmly on the easel’s lower brace. This tableaux automatically declares her entire domicile a studio space and speaks to the miracle of possibilities for women artists of our time. Motokawa readily admits that she also enjoys working while simultaneously listening to documentaries on the television. Emi’s ability to concentrate in the midst of such responsibility is a gift to us all. We look forward to a world where our creative time and space can be intrinsically supported, respected and accommodated. Until then, Emi knows the art of bending time and will rise to any great occasion. Emi Motokawa is a powerhouse. This collection, in particular, is revolutionary. It must be received in person and is not to be missed. Guests should arrive ready to eat the best vegetarian buffet for miles and have their minds and hearts blown wide open. Buddha Nature runs through Dec. 18th, 2016. The Hsi Lai Temple Fo Guang Yuan Museum/Gallery is located at 3456 Glenmark Dr., Hacienda Heights, CA 91745. Motokawa will also exhibit her work at an upcoming Avenue 50 Gallery solo show. Details will be available through Brooklyn & Boyle soon. Pictured above: Keepers of the Dharma, 2016, Acrylic on canvas, 36" x 36."